SynergyO2 is certified by the Ministry of Health in the category of food supplements. It’s very simple. You drink SynergyO2 with water. 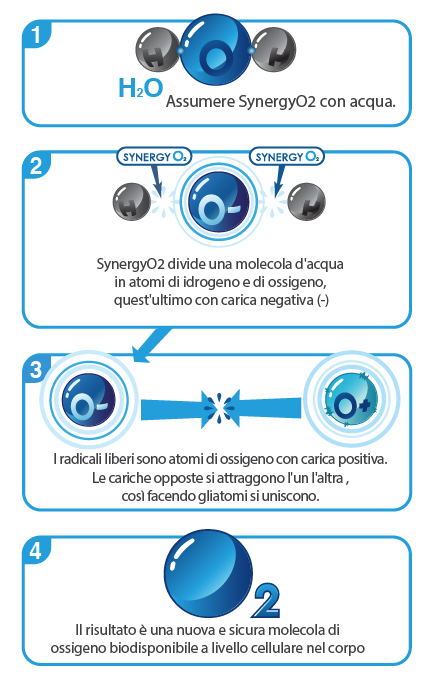 SynergyO2 splits a water molecule into atoms of hydrogen and oxygen, this last one negatively charged. (-). Then, free radicals, which are unstable oxygen atoms positively charged, bind with the oxygen molecule negatively charged, this happens because opposite charges attract themselves. The result is a new and safe oxygen molecule bioavailable at a cellular level. Provides the essential amino acids aiding the metabolism of proteins. It helps normalize the body’s pH. For more information regarding the recommended dosages, please consult the following document.